Mingaungshwegu pagoda stands half a mile away from the palace site and 200 yards away from the south of Pharaoat pagoda. Nat Shin May, the chief queen of king Thi Ri Thu Dam Ma Ra Za, built the pagoda. The pagoda is the solid conical structure. The pagoda was built by fitting the stones properly. The receding terraces have the porches. The workmanlike stone sculptures were made at the pediments of the porches. 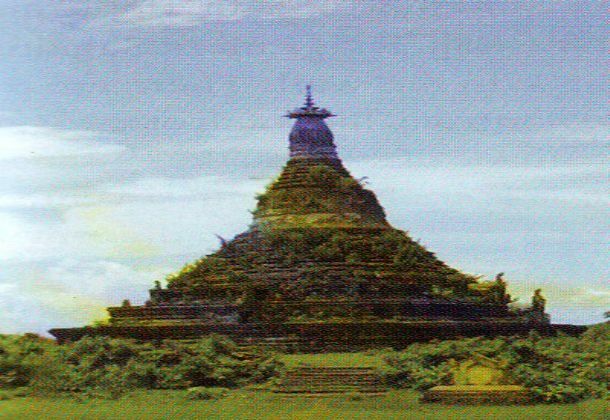 The upper part of the pagoda is inclining a little towards the ground because the treasure hunters burgled the inverted alms bowl of the pagoda. The department of archeology maintained the porches. Queen Nat Shin May was an outstanding queen in Mraukoo period. She was famous not only for good reputation but also for bad reputation. The examination of the repeating Buddhist scripture by heart, was held in the month of Nattaw in Mraukoo period. The honorable parade was made for the person who gets the first prize wearing the umbrella. Nat Shin May had to go around the city in celebration wearing the big white umbrella attached to seven small umbrellas because she got the first prize seven times. Although she was outstanding in literature, she fell in love with minister Ku Tha La abandoning her husband in consequence of her previous life Kamma. She caused king Thi Ri Thu Dam Ma Ra Za dead in Pattara Ngasay dance, a king of necromancy. Nowadays, the department of archaeology reconstructed it.